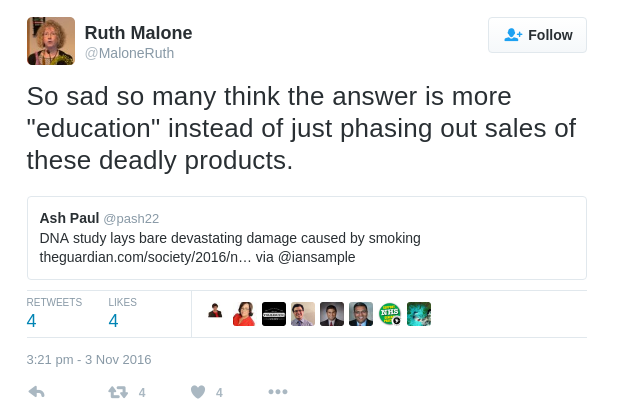 While very occasionally I see an almost vague pro-vaping tweet from Ruth Malone, she is very much in the close circle of friends that include the likes of Simon Chapman, Stan Glantz and Martin McKee. I saw Greg Conley respond to a tweet of hers recently, which I think really sums up Tobacco Control in a nutshell. The translation of this message is that it's sad that we have to rely on, trust and respect people's freedom to choose, rather than being able to use force to get them to behave the way we want them to. Basically, Don't Motivate, Just Ban. I think another problem with TC's thinking is the misconception of tobacco education. Tobacco control's methods of educating the public about the dangers of tobacco are so flawed, and they know it's not working. To suggest that "more" education only seems useless, and it is given their approach. The misconception is that "more" education is required. What really is needed is "better" education, and they could start by teaching smokers that nicotine is not the problem, it's the smoke, and that there are healthier ways to get that nicotine including e-cigarettes. Last edited by PurpleVapes; 06-11-16 at 05:30 PM.